To make the ginger and vanilla pastry, place the flour, baking powder, ginger, sugar and butter in a food processor and process until the mixture resembles fine breadcrumbs. With the motor running, add the water and vanilla and process until the mixture comes together to form a smooth dough. Roll the pastry out between two sheets of non-stick baking paper to 4mm thick and refrigerate for 1 hour or until firm. Preheat oven to 180°C (350°F). Melt the butter in a medium saucepan over high heat, add the apples and cook, stirring frequently, for 4–5 minutes or until softened slightly. Add the rhubarb, raspberries, sugar, lemon rind and juice and vanilla and cook, stirring occasionally, for 15–17 minutes or until the fruit is tender and the liquid has thickened. Transfer to a bowl and refrigerate until cooled. Spoon the mixture into a 1-litre-capacity pie dish. Using various-sized fluted round cookie cutters, cut about 22 rounds from the pastry, re-rolling as necessary. Layer the rounds over the top of the rhubarb and sprinkle with the extra raw sugar (see tip). Bake for 20–25 minutes or until the pastry is golden and crisp. Serve warm. Serves 6–8. 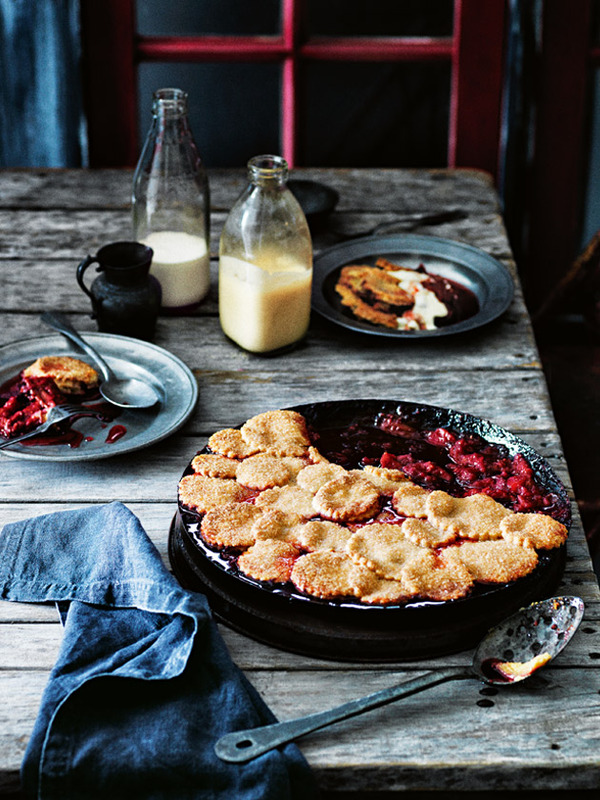 Tip: Place your pie dish on a large baking tray, to catch any spills while in the oven.